The Consumer Product Safety Commission (CPSC), Hallmark Specialty Retail Marketing Group Inc., of Kansas City, MO, operating under the name Hallmark Creations, is voluntarily recalling about 1,300 metal and plastic tea light lamps. The plastic shade that covers the tea light candle can melt, posing a fire hazard. The lamp has a clear plastic lampshade that covers a base for holding candles. A dark brown curved S-shaped support wire that is decorated with leaves supports the lampshade. The recalled lamp is about 12-inches tall and 4-inches in diameter. The labels on the bottom of the base read "Creations" and "MADE IN TAIWAN." For more information, call Hallmark toll-free at (800) 425-5627 between 8:00 a.m. and 5:00 p.m. CT Monday through Friday. 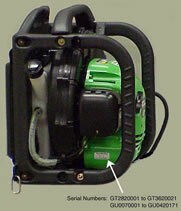 Consumer Product Safety Commission (CPSC), and the following companies Husqvarna Forest & Garden Co., of Charlotte, North Carolina; John Deere Consumer Products Inc., of Moline, Illinois; Makita U.S.A. Inc., of La Mirada, California; Carswell Import & Marketing Associates Inc., of Winston-Salem, North Carolina; and Tilton Equipment Co., of Rye, New Hampshire are recalling about 50,500 backpack blowers. The fuel tanks on these blowers can leak, posing a fire hazard and risk of burn injuries to consumers. The National Highway Traffic Safety Administration (NHTSA) has published a recall affecting certain 1999-2001 Suzuki Grand Vitara vehicles manufactured between June 1998 and June 2000. This recall affects 59,888 vehicles. On certain sport utility vehicles, when temperatures are below minus 25 degrees Celsius (minus 13 degrees Fahrenheit), moisture can freeze in the fuel pressure regulator. Fuel system pressure could increase at the time of engine start up, causing fuel loss at the fuel pipe/fuel hose connection. Fuel loss in the presence of an ignition source could result in a fire. Dealers will install a redesigned intake manifold vacuum union and a new fuel pressure regulator. Owners who do not receive the free remedy within a reasonable time should contact Suzuki at 1-800-934-0934. The NHTSA Recall Number is 01V146. The Suzuki Recall Number is X4. The NHTSA notice can be viewed at http://www.safetyalerts.com/recall/a/012/v146.htm. The National Highway Traffic Safety Administration (NHTSA) has published a recall affecting certain 2000-2001 Rolls Royce Corniche, Bentley Azure and Bentley Continental T, R and SC models. The affected vehicles were manufactured between August 1999 and March 2001 and involves 408 vehicles. Fuel vapors stored in the vehicle's evaporative emission control system could leak into a body cavity behind the rocker panel on the driver's side. If vapor is emitted and the vapor collects in the cavity, the resulting air/vapor mixture could be ignited if the central window operating mechanism is activated. Dealers will install a plated mild steel extension pipe to the leak detection filter of the vehicle which will ensure that any vapor emanating from the evaporative emission control system is vented to the outside the vehicle. Owners who do not receive the free remedy within a reasonable time should contact Rolls Royce at (800) 777-6923. The National Highway Traffic Safety Administration (NHTSA) has published a recall of 66,000 regulators affecting Grand Hall Propane Regulators manufactured between January 1996 and December 1999. Model 6000 automatic changeover regulators, which are used with propane-fueled camping trailers equipped with a propane fuel source, contain two rubber diaphragms in which the second diaphragm can tear under pressure, resulting in a propane leak. A possible fire can result in the presence of an ignition source. Grand Hall has notified its customers to return the Model 6000 propane regulators to the store where they were purchased for a replacement regulator free of charge.